Oak Ridge Construction, founded in 1996, has been winning awards for quality craftsmanship ever since it began. Primarily built on repeat business and referrals from our many satisfied clients, Oak Ridge is owned and operated by Mike Dion. With a proven track record in the renovations industry, Oak Ridge has developed a carefully selected group of long-standing professionals who provide loyal service and dependable products. We hold a strong belief in treating our team and customers like family. Our team adheres to our high standard of quality and attention to detail. We deliver cost-effective solutions in an efficient and responsible manner. Oak Ridge highly values longevity in our workmanship and client relations. We proudly guarantee our labour for a minimum of 2 years. We carry liability insurance coverage of five million dollars and worker’s safety insurance, and our minimum standards exceed all Ontario Building Code Standards. Our team will meet your requirements and exceed your expectations with our customized designs and experienced recommendations. Mike Dion - A graduate of Algonquin College in their 3-year Business & Administration program, Mike worked alongside his Dad at Canada Trim installing hardware, shelves & trim at the early age of 14. Inheriting his father’s valuable handyman skills, Mike loves to problem-solve challenging renovations and cost-effective solutions. 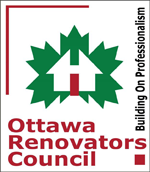 Ottawa has been Mike’s home since 1978, where his passion for refurbishing older homes with more usable living space has found roots in the area’s stately architecture, while his flare for modern design has created fresh and tasteful improvements.